Elizabeth Ohito, a second-year in the College and publicity chair of the Organization of Black Students, said, “Dr. Gates was our natural first choice this year. In his work, Gates thoughtfully addresses American politics, cultures and social perspectives, and their relationships to the African-American experience. One of his most recent projects, which he wrote and produced, was the documentary, African American Lives, which aired in 2006 on the Public Broadcasting Service. The documentary, which Ohito called, “very influential and noteworthy,” is the first to use science and genealogy to trace African-American ancestry. Gates also wrote and produced two earlier documentaries for PBS and the British Broadcasting Company. 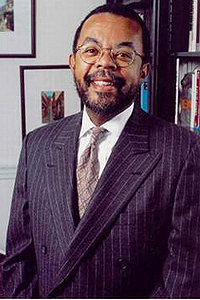 Before he joined the faculty of Harvard University in 1991, Gates had served as a professor at Yale, Duke and Cornell universities. He currently serves as the W.E.B. DuBois professor of the humanities and director of the W.E.B. DuBois Institute for African and African-American Research at Harvard. Additionally, Gates served for more than a decade as chair of Harvard’s Department of African and African-American Studies. During his career, Gates also has received 44 honorary degrees. He is the editor of Transition magazine, the editor-in-chief of the Oxford African American Studies Center at Harvard University and the co-editor of Encarta Africana, an encyclopedia published both in text and on CD-ROM. He has published several books, including African American Lives, America Behind the Color Line: Dialogues with African Americans and The Annotated Uncle Tom’s Cabin. Gates’ work as a public cultural critic includes a Time magazine cover story in 1994, numerous articles published in The New Yorker and a guest column in The New York Times. Gates’ lecture will be at 7 p.m., Thursday, Feb. 22, in Mandel Hall, 1131 E. 57th St. The event is free and open to the public, although seating is limited. Early arrival is recommended. The Kent Lecture is held in honor of George Kent, the former Chicago professor, who taught in English Language & Literature from 1970 until his death in 1982. Every year the Organization for Black Students brings a prominent member of the African-American community to campus to speak on relevant social issues. Past speakers have included Cornel West, Nikki Giovanni, Angela Davis and Gwendolyn Brooks.